The ice cream cake for my 30th last year made me cry. 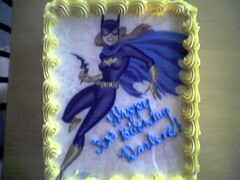 It wasn’t so much the cake itself as the art that graced the top of the cake: a Batgirl sketch by Bruce Timm. No, no…. Mr. Timm did not get behind the counter and decorate it himself but the art was tranferred there via edible ink. I don’t have any footage of me tearing up as I received this cake but if I did, I would probably submit it here. I got your birthday wrong earlier this year but I'm not going to miss it on the correct day — July 2! Where did this AWESOME cake come from??? Not just art, but cheesecake art?!?! My brain just exploded. Hi again Kate.I was told the cake was obtained from Baskin Robbins. Provide a photo and they will slap in on the cake. The cake is actually your choice of ice cream and either chocolate or white cake. The art is by one of my favorite artists, Bruce Timm. You can check out the rest of his gallery.